While working on plankton with Dave, at the MBA labs, we were shown a collection of tiny larval fish, a mixture of pilchards and sprat, that had been previously captured and preserved in alcohol. To find out more about the lives of the fish in the sea, we need to understand the behaviour they show early in their lives. This includes what they eat. With a larger fish, this is as simple as catching it and recording the debris that falls out of their stomachs. On a larval fish, however, a dissection is not so easy, requiring a microscope, needles, steady hands and a lot of patience. When the fish first go into the alcohol, they will often vomit up the contents of their bellies, leaving nothing behind for us to find except for lines of tubed intestine. Luckily, we couldn’t really spill the fish’s guts as we had never done it before, and it was harder than you might think. Dave himself has done thousands of such dissections and can now be considered a master. Looking under the microscope, I savagely ripped apart three tiny fish in search of the plankton that they were supposed to eat, finding it easier to take apart the smaller, squatter fish as their innards were visible from outside the fish, instead of stretched across the longer larvae. Eventually I managed to produce a small skeleton from one of the fish, the calcified remains of phytoplankton called cocoliths, the same type that form the chalk downs near my house, and the white Dover cliffs. 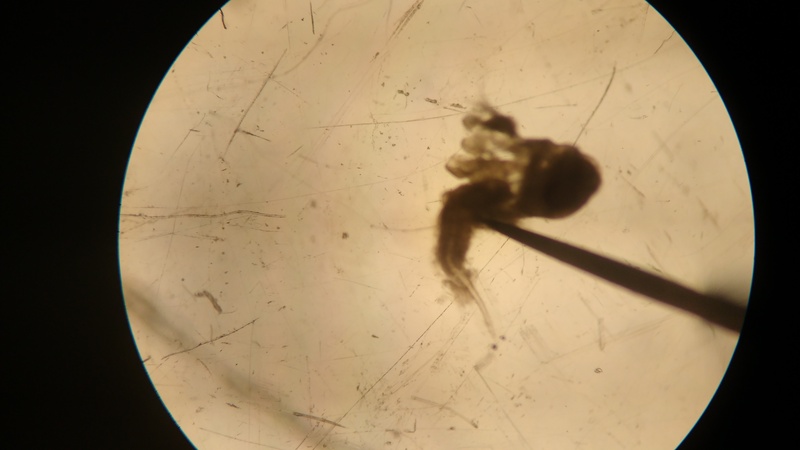 It was an interesting and challenging task, taking me several tries to yield even one measly plankton corpse, but with time and experience, people can find out what species these little fish consume, and tell us more about the miniature ecosystem that we can’t see.